Soleil… sol… ilios… sole… sunce. No matter the language, you’ll find sunshine and sea views in abundance on the Mediterranean. Located in the upscale Eixample district on the busy promenade of Rambla de Catalunya, Barcelona boutique hotel Murmuri is a place to see and be seen. All understated elegance – interiors have been designed by British style maven Kelly Hoppen – and quiet intimacy, it hits the right notes for well-heeled locals and visitors alike. Villa Dubrovnik is Croatian through and through: built from grey Brac stone, styled by two local designers, and boasting Adriatic views that a seagull would migrate for. Days here are idled away at the flower-flanked outdoor pool, serene spa and ambitious Mediterranean restaurant that’s worthy of a Michelin star. Locanda al Colle hotel, an art-filled guesthouse set in a Tuscan olive grove in Versilia, combines the best aspects of home and hotel and welcomes guests like old friends. Candlelit dinner parties replace run-of-the-mill room service on these gorgeous grounds lush with leafy gardens and an inviting outdoor pool. You won’t miss the TVs, replaced by Cubist art, big reading chairs, and views out to the sea. The buildings of the all-white Anemi Hotel on Folegandros look, from a distance, like giant sugar cubes overlooking the turquoise Aegean. And, once you get up close, this Greek-island getaway guarantees a stay as stylish as the views are stunning. Sweet scents waft around olive and lemon trees in huge pots outside JK Place Capri, a Fellini movie in hotel form, that’s far away enough from the buzz and night-life noise, yet somehow still managing to feel in the thick of things. This gleaming white, shore-side hotel is the kind of place you want to re-book as soon as you leave. 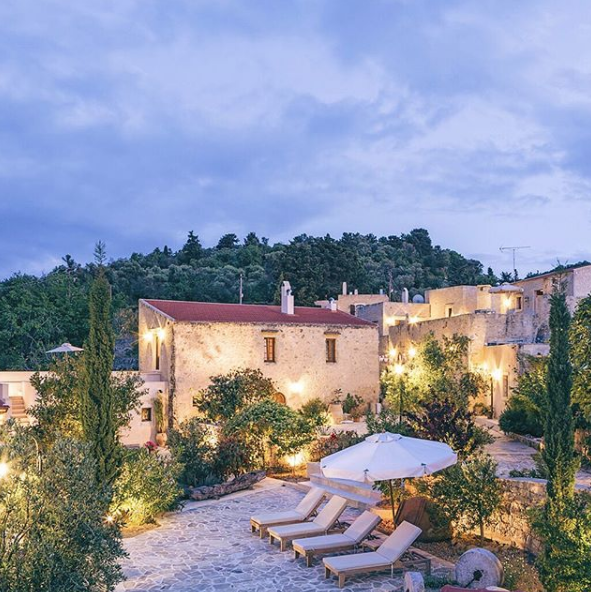 Kapsaliana Village Hotel’s history-steeped settlement, set in the island’s largest olive grove, has an 18th-century olive press and its own museum. The original press and pitharia (clay storage vessels) can still be admired and there’s a homely restaurant and a flower-flanked outdoor pool. Rooms are soothingly simple: stone interiors and arches. Housed in a cluster of white-washed stone buildings overlooking the Aegean Sea, boutique hotel San Giorgio Mykonos is a pared-down retreat for island hedonists. Flop in a hammock by the pool, explore the rocky shores of the private beach, then dance the night away under the starry skies – crashing in San Giorgio’s sleek boho rooms will feel like coming home. Ingeniously engineered into the cliff-side, Cavo Tagoo is a multi-pooled paradise of a boutique hotel, minutes from Mykonos Town in the Aegean Islands. Spacious and contemporary, this luxury getaway offers five-star spa pampering, peaceful privacy and Jacuzzis for all.